Maureen Flowers - born on 6. December 1945 - was for many years the female number 1 in darts. Flowers learned to play darts as a small girl in her father's pub. As she was first too small she played standing on a barstool and her father taught her. 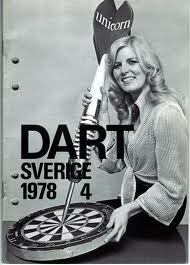 1971 when she already administered the pub Flowers founded a ladies darts team. Together with her friend Yvonne Allen she won in the Alexandra Palace in London the Ladies National Pairs Competition. It was her first big success and was followed by countless other titles. 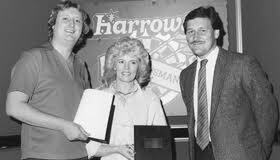 From 1976 she took part in Indoor League which for the first time televised darts. At the end of 1979 when she already had divorced from her husband former soccer player John Flowers and had three little sons she became the first ever female professional darts player. It was no easy life to be sure and it wouldn't haven been possible without her mothers who looked after her sons. Flowers was constantly away from home and passed most of her time sitting alone in hotel rooms. There were no other female pros so she had to play amateurs who begrudged her good looks and her blond hair. For a long time Flowers was the captain of the English women's national team. On the peak she was for some time the partner-in-life of Eric Bristow, for a short time she managed Phil Taylor. Probably it was she who drew Bristow attention to Taylor and suggested to him to sponsor his talent financially. Together with Bristow she travelled around on the exhibition circuit. Flowers who got the nickname "Goldfinger" practiced for 1, 5 hours a day. She never drank alcohol when she played tournaments instead litres of tea, bitter lemon and lemonade. She always took loads of vitamin C. Flowers was sponsored by Unicorn and played with by herself designed Unicorn signature darts. In 1988 Flowers ended her professional career and then for many years owned the Hotel Sneyed Arms in Turnstall near Stoke-on Trent. The family pub in 2007 was transferred to her son John. When Flowers father died in 2012 she sold the pub and returned to her home town Norton Green but still has connections to Turnstall and has got a late night alcohol delivery company. Today Flowers plays much more golf then Darts. Maureen Flowers always assumed that women are just not able to play as good darts as man. For her the top level women can achieve lies about as high as the range of an average male darts player.